Welcome Annabelle to Willow Glen Music School! 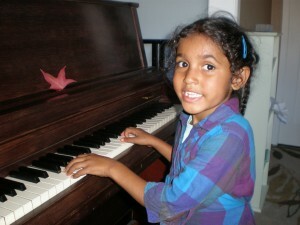 Annabelle started piano lessons here at Willow Glen Music School about a month ago. Her teacher Joyce says she is a gifted and delightful student to work with. She picks things up fast in her lessons. Her mom also plays piano, which is a big bonus! We are so happy you found us and look forward to hearing you play in the next recital. Posted in Uncategorized.Tagged best music schools in san jose, best piano teacher san jose, ca, guitar lessons, guitar lessons in san jose, guitar lessons san jose, music for children, music lessons, music schools, music schools san jose, music teachers, piano lessons, piano lessons campbell, piano lessons willow glen ca.